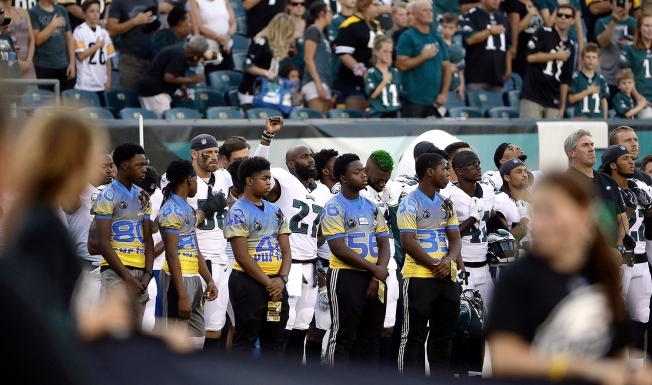 Malcolm Jenkins resumed demonstrating during the national anthem Thursday night. Jenkins and cornerback De'Vante Bausby raised their fists, protesting against racial and social inequality in the United States. Chris Long put his arm around Jenkins. And Michael Bennett walked out of the locker room late and continued to walk down the sideline behind his teammates while it played. Jenkins and Bennett told the Philadelphia Inquirer earlier this week that they weren't sure what they were going to do during the anthem. During last season, Jenkins stopped his anthem demonstration (raising a fist) after the NFL pledged $100 million to causes aimed at combatting social injustice. He clearly thought they were on the right track until the new policy. Then came the NFL's anthem policy, which was created, then put on hold. This is the first time the Eagles have had a game since the new national anthem policy was created and then halted. Last month, the policy was put on hold thanks to an NFL agreement with the NFLPA. Basically, the new anthem policy stated league personnel must "stand and show respect for the flag" and if they choose not to, they may stay in the locker room until after the song has been performed. Under that policy, teams would be fined by the league, not players. And then teams would be responsible for disciplining players if they wanted to. Bennett, whom the Eagles acquired in a trade this offseason, sat through the anthem last season while still with the Seahawks. Like Jenkins, Bennett has been very outspoken on matters of social and racial injustice.